Supplied: In a 3 litre container of peat-free compost, healthy and well established, approximately 90-120cm (4 feet) high, with full planting and aftercare instructions. We have some beautiful indigenous trees in the UK and Ireland, but it sometimes feels North America got more than their fair share when the native flora was being dished out. Liquidambar styraciflua originates from the southern and eastern regions of the U.S. and has a number of ornamental features to ensure it provides long seasons of interest, all from an early age. 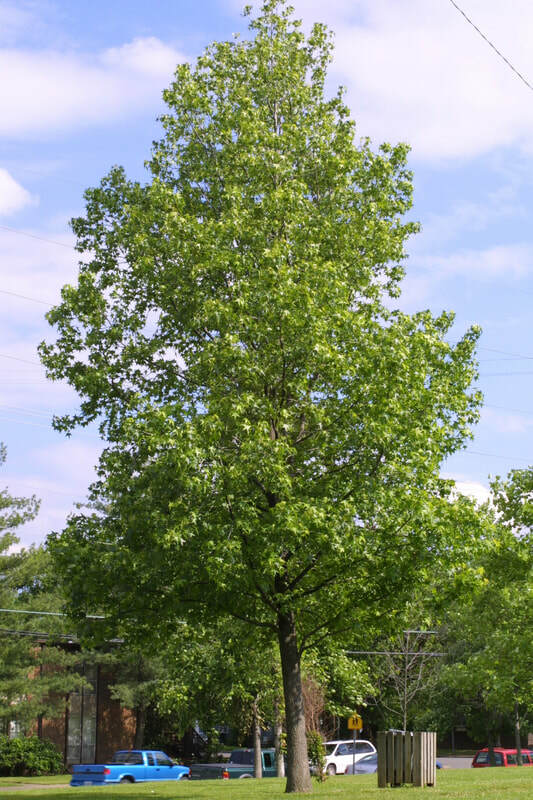 The Sweet Gum is a tree that shows strong apical dominance resulting in an attractive central leading trunk and handsome symmetrical almost pyramidal canopy. Whilst still in its juvenile years the bark of the trunk and main branches begins to fissure and becomes corky adding interest to the garden throughout the year. It is however autumn when Sweet Gum's are most splendid. The maple like deeply lobed leaves begin their magnificent display as early as August with gorgeous crimson and gold colourings that remain on the branches well into winter. Liquidambar's enjoy most garden soils that are reasonably free draining and fertile, they do not however thrive and display their best colour on shallow chalky ground. If you have a garden of high pH with lime soil check out Liquiambar styraciflua 'Worplesdon' as it is the best cultivar for those conditions.